Tornadoes are among the most feared weather phenomena because their dangerously strong winds can cause devastating damage that has been known to take lives. The winds of a tornado can exceed speeds of 100 miles per hour which can easily damage homes and buildings as well as uproot trees and toss cars and other heavy debris as if they are toys. 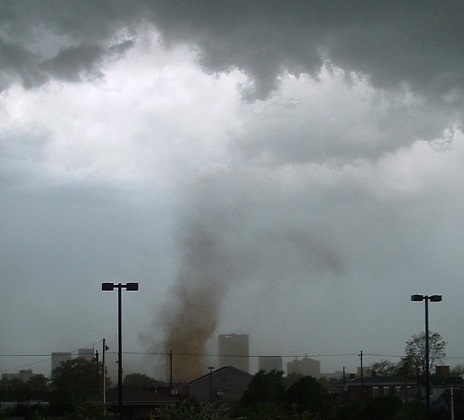 The United States experiences more tornadoes per year than any other country in the world and even though the Southeast and Midwest are the most vulnerable, it is possible for a tornado to form anywhere in the U.S. Before a tornado occurs, there are usually several warning signs of the impending storm. It is very important to recognize the signs of a tornado so that you can prepare and get to a safe location, especially if you live in a tornado prone area. Most people become aware of the possibility of a tornado in their area from the news which puts out a tornado watch or a tornado warning. If your area is under a tornado watch, this means that your area is experiencing weather conditions in which it is very possible for a tornado to form. You should be on alert if a tornado watch has been issued so that you are ready to react if the situation becomes more dangerous. If a tornado warning has been issued, this means a tornado has been seen in your area and you should seek out an appropriate shelter for safety. There are several observable warning signs of a tornado that will let you know when the threat of a tornado is imminent. The early tornado signs include increasing winds, rapidly moving clouds, and a greenish color to the air and clouds. Hail, which is another early warning sign of a tornado, is what causes the sky and clouds to appear green or greenish yellow. Wall cloud: Tornadoes begin to form when a large wall cloud descends from a thunderstorm. It is not unusual for the wall cloud to rotate. Large hail: Strong enough thunderstorms can easily produce hail and sometimes just the production of hail can cause a tornado to form. Debris cloud: Some tornado funnels are practically invisible but they all have visible debris clouds where they touch down. Funnel cloud: The funnel cloud is the telltale sign of a tornado. It extends out and rotates from the base of a thunderstorm. 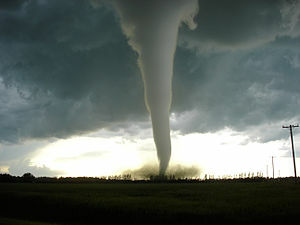 Roaring noise: The strong wind of a tornado gives off a loud roaring noise that can be heard when a tornado is nearby. The most effective way to keep your home and family protected from tornadoes is to prepare beforehand and have a safety plan established for when a tornado does occur. Choose an area of your home to take shelter and make sure your family understands what to do when there is an impending tornado. This blog regarding tornado preparedness and safety provides more information on how to prepare for a tornado. If you live in an area that is vulnerable to tornadoes, make sure you are familiar with the warning signs of a tornado so that you can prepare and take shelter. However, even the most extensive preparation cannot prevent a tornado from causing significant damage to your home. If this happens, it is important to call a storm damage restoration professional immediately to clean up the damage and get your home back to its original condition.